my bolt is showing blue light stable . not showing cloud light , clout light is off. bolt id is also showing on my dashboard of cloud.boltiot.com. 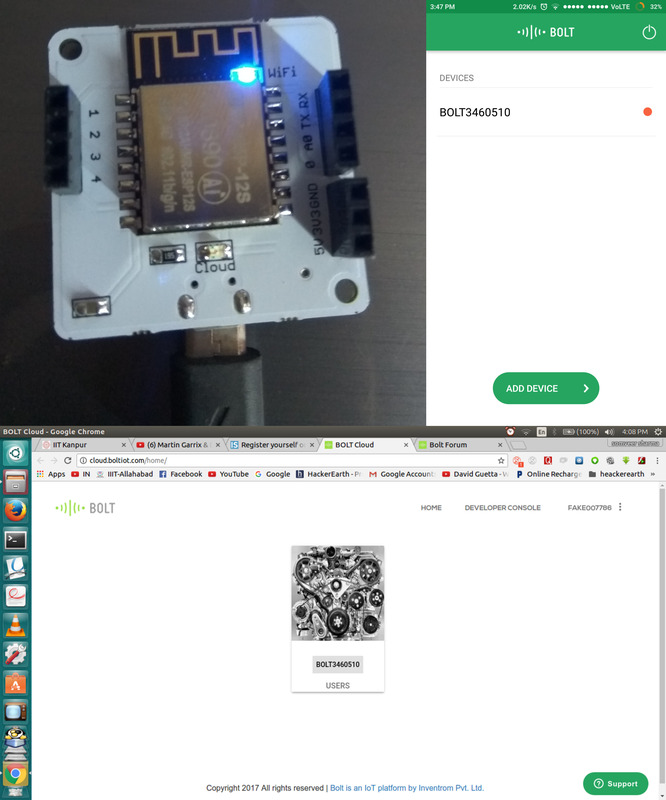 The module is not connected to the internet though it is connected to wifi. In this case, check your internet connection. The module is not connected to Access Point(wifi router). When the bolt module connects to wifi the blue LED stops blinking. the Internet access of the Wi-Fi network is turned off. You can switch on the Internet access for the network or use an alternate Wi-Fi network to connect the Bolt. the Internet speed is too slow for the Bolt to connect to the cloud. You will have to use an alternate Wi-Fi network in this case. 3: The WiFi network has an internal authentication system where the user has to open a page and enter the username and password after connecting to the Wi-Fi network to enable Internet Access. Bolt devices do not support such Wi-Fi networks. You will have to use an alternate Wi-Fi network in this case. The Wi-Fi network’s AP band is not working at 2.4 GHz. Bolt supports only 2.4 GHz band so the Wi-Fi network should work at this frequency. You can edit the Wi-Fi settings to work at 2.4GHz. If your Wi-Fi network does not support 2.4GHz then you will have to use an alternate Wi-Fi network in this case. hi @pranav.kundaikar Same problem happens with me, I just check all the details that you have mention all are normal. Green light is still off. Sorry I missed out on your reply. Hope I am not too late in replying. Have you been able to resolve the issue? What’s the status of the green and blue and LEDs on your Bolt? Even I’m facing the same problem.My bolt wifi module is showing offline(red color dot).please help me out. Have you tried the suggestions mentioned by Pranav? Do make sure you go through all the reasons which might cause this problem and verify them. Do reply back if you are still facing the issue. even i faced the same issue.above threads are quite helpful.Thank you so much for resolving this issue. it helped me to pass the deadline with no hurdles.